Tommy Berwick says AFC Rushden & Diamonds’ fine start to the season has filled him with belief that they can challenge for the Evo-Stik Southern League Division One Central title. 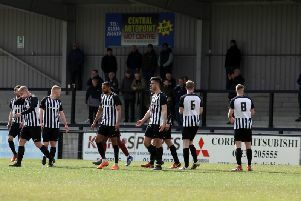 Having kicked off the new campaign with three successive draws, Andy Peaks’ team are now on a run of four wins in a row, one of which came in the preliminary round of the FA Cup as they won 1-0 at Kings Langley last Saturday. That was followed by a 2-0 victory over Bedford Town on Bank Holiday Monday, which sent Diamonds into second spot in the table. They are now preparing for a trip to winless North Greenford United on Saturday knowing that if they avoid a loss, it will create a new club record of 28 matches without defeat. But a win could also put them on top of the table and that is a position that frontman Berwick is beginning to eye up for the long-term. “During pre-season I think the lads were looking at it and thinking that getting into the play-offs would be a realistic aim,” Berwick said. “And after we had a tough game against Petersfield on the first day I thought to myself ‘hang on a minute’. “But now we are few a games in, I really believe we can push for the title. “Kettering and Rugby have been strong sides at this level in the past couple of years but they have both gone and I don’t think there’s a lot between the rest. Berwick could claim to be something of a lucky charm for Diamonds. He has been with the club for 25 of the past 27 matches they have gone unbeaten and is, therefore, yet to taste defeat in a Diamonds shirt. But he insists the potential of a record-breaking day this weekend isn’t something the squad are thinking about. He joked: “We haven’t lost a game since, although how much of that is down to me I am not sure! “I am just trying to work hard for the team and I think that’s what the manager likes about me. “To be honest, it (the club record) isn’t something we have spoken about. “It is a good thing that we have gone on such a good run but it’s not something that is on the players’ minds. Diamonds, meanwhile, now know they will travel to Combined Counties League Division One side Bedfont & Feltham in the first qualifying round of the FA Cup a week on Saturday. Bedfont claimed a 3-1 success at AFC Hayes in their preliminary round replay on Tuesday night.